Why Listicles Are Shareable Contents | Meet a LinkBuilder and Learn Everything about SEO! Is 2014 the breakout year of listicles? Absolutely! Online, we see lists everywhere – from simple blogs to global news portals. But, do you ever wonder why these listicles are so popular? Actually, there’s a science behind our growing fondness of lists. Known as the ‘top-ten effect’, we ‘chunk’ numerical lists and make the information digestible for us. We – humans – have mental tendencies that form part of our readiness to perceive things around us in discrete forms such as ranked lists. Based on the findings of a study published in the Journal of Consumer Research in 2013, our mind loves to use categories especially if they end in five or zero. That’s why we love top 10, top 25 or top 30 lists more than top 3, 7, 9, 11, 17, 22, etc. Now that we understand what drives people to click, read and share listicles, let’s move on with determining what makes these ranked lists highly share-able. Listicles are… inherently social. 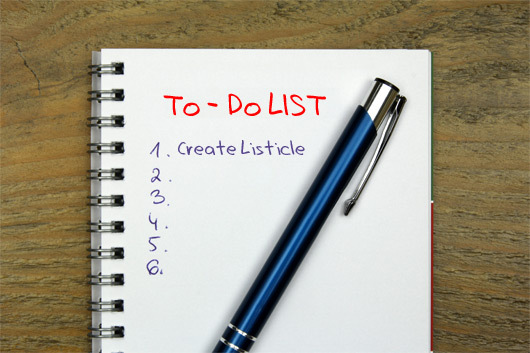 Lists can be easily and immediately shared particularly on social media. … very engaging. Oftentimes, lists resonate and relate with the readers, converting them into active participants. Aside from sharing, they also like and comment on the list. … eye-catching. The headlines are witty and creative. They stir the readers’ curiosity. … straightforward. They don’t mess up with the expectations of the readers. Well, of course, because they know exactly what type of information the list contains. … graspable. Readers quickly understand its contents. Just skim and scan the contents to know what gets into the list. … organized. The Internet is not only chaotic; it is also a hodgepodge of anything and everything under the sun. Wouldn’t it be nice to have someone list the bests and tops for you? … creative! They don’t follow any formula. Just take a cue from this listicle. … fun to read. Admittedly, listicles make us LOL. In fact, listicles having the most number of likes, comments and shares are humorous lists. Furthermore, a listicle… appeals to our emotion. There are only four categories of highly shareable contents: awe-inspiring, positive, surprising and emotional, and listicles are all these and more. … tells a storyalthough in a different way. In some instances, listicles are a story on its own or a sub-plot of a series. … fits a lifestyle. Ranked lists are for the younger digital audience. Such an audience demands bite-sized information because they have shorter attention span. They prefer to read everything in one sitting. These people ‘snack on information.’ Reading is done on free time (or during Twitter or Facebook time), and it is not deliberate and intentional. They just stumble upon this information. … spreads on its own. In other words, lists are viral. Just look at the factors noted above. Shareability is tricky. It remains to be a challenge among website publishers, online marketers, digital agencies and even SEO specialists. Communities are different from one another. As such, a one-size fit all approach to interaction and engagement is not applicable. While it takes more than an intriguing photo or an amusing headline, shareable contents have one thing in common. It’s the hook or the connection with the audience, generating discussions and responses naturally. Even this aspect is very challenging. Perhaps, overcoming the challenge deserves another listicle. What do you think?